My new book comes out on 2nd May! That’s tomorrow! 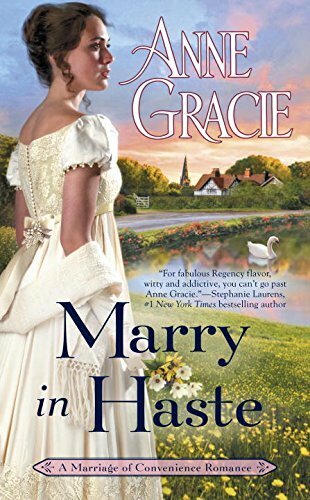 Marry In Haste is the first book in a brand new “Marriage of Convenience” series. Launch day is always nerve-wracking for me, wondering whether readers will like the book or not. Each novel has something for me to worry about — in this case it’s that the romance is a slow burn, rather than insta-love. The heroine doesn’t even appear for several chapters. Some readers don’t like that. Others do. But it was right for the book and for my characters, so I’ll just have to wear it. The slow burn is because my hero, Cal Rutherford (who has just become Lord Ashendon) has a LOT to learn. I love Cal. He’s a soldier, used to snapping our orders and having them instantly obeyed. But now he’s having to deal with females, especially female relatives, and it’s not easy. Strangely, women and young ladies don’t respond well to have orders tossed at them. Who knew? Certainly not Cal. Here, Cal is telling his friend Galbraith, also a former soldier, about his difficulties. MARRY IN HASTE comes out May 2nd. I hope you enjoy it. Here’s a universal link for e-books; otherwise shop at your favorite bookstore.